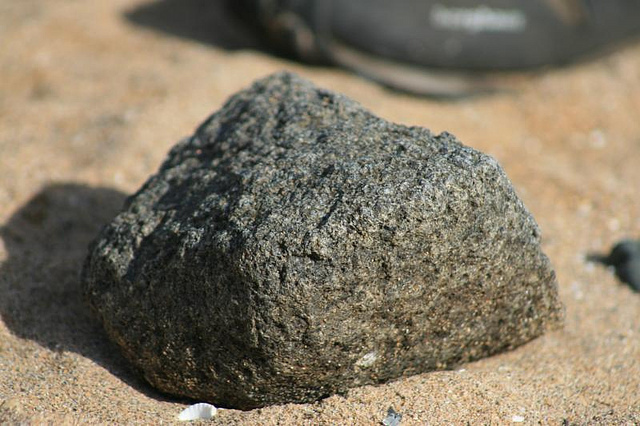 Dolerite is a dark igneous rock. It is a mafic rock, containing magnesium and iron, often in form of olivine. Like other mafic rocks, it is relatively low in silica content. It is a medium grained igneous rock, and can be dark grey or black with greenish shades in colour. Minerals in this rock include olivine, plagioclase feldspar, pyroxene, quartz and sometimes ilmenite, biotite, hornblende and magnetite. It often forms in basaltic provinces as sills and dykes, (which are igneous intrusions). Some of the most famous occurences are in New Jersey in The US (the famous Palisades), at Lake Superior in Canada, in north-east England (as well as the famous ancient stone circle Stonehenge! 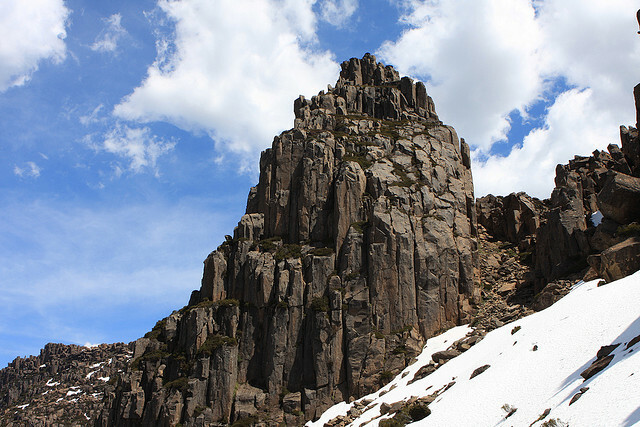 ), and on the Tasmanian island in Australia.